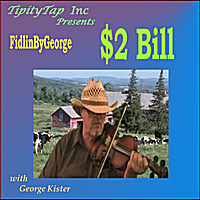 FidlinByGeorge ( aka George Kister) has some interesting qualities and experiences. George has a unique blend of Singing and Fiddle Playing Together - SomeTimes he plays a guitar. This talented musician blends Classic Country with BlueGrass and Folk Music in an interesting manner. He has an Interesting blend of live music mixed with synthesized for the best of old and new worlds. He was born and raised in Wyoming, The heart of CowBoy Country. He worked custom Hay Stacking and Sheep Sheering Crews on many ranches. He feels very at home on ranches and farms. He spent many days on a rodeo fence while his father Bull Dogged (Steer Wrestling). In his twenties, he spent three years in the army. "I liked to Parachute out of airplanes and drive my 2-1/2 Ton Dump Truck in my Combat Engineer Batalion" He says smiling a big grin. In about fourth through seventh grades, he would spend summers with his father's combine crew on the Kansas to Canada route harvesting grain with three Combines and Trucks, Two house trailers, One for Cooking and the other for a Bunk House. Wnen George was a small boy he used to sit in the kitchen and listen to his mother sing Rockabilly to the Radio. She later went on to win Fairs and Contests with her singing. If George sings a little on the quick side, he comes by it naturally. His father was an auctioneer and during George's thirties he spent six years auctioneering following in his fathers footsteps. At thirty, he picked up a harmonica and started playing it by ear. "I got awful bored driving fifty to a hundred miles a day in the Oil Patch. So I picked up a harmonica and started playing it by ear to the country radio stations. One hand to drive and the other to play my harmonica. That's when I was young and not so smart. Would'nt advise it today." He picked up a fiddle at Fifty-Five and his music reflects the vast experiences of his life. "Don't listen to people tell that you can not make music and it's never too late to start. Just pick something up and start playing or singing." He encourages. He signs off saying " Hope you all enjoy my music as much as I do." "$2 Bill / Long Journey Home" Reviewed by RadioIndy.com! A unique blend of Singing and Fiddle Playing Together a blend of Classic Country, BlueGrass and Folk Music in an interesting manner.